As a state science agency, we have to take the science we produce, get it into the hands of those who need the results, help non-technical users understand it, and work with them to deal with the consequences of what we learned. To that end, the AZGS has formed a Geologic Extension Service to integrate our publications, map and bookstore, library, website, outreach, inquiries, and education functions into a coordinated program to more effectively transfer our work to those who want to use it. The GES is modeled on the well recognized concept of the Agricultural Extension Service that helped bring the best technologies to farmers across the country, helping make US agriculture the most productive and efficient in the world. We hope to provide similar service with geologic information and assistance in natural resources, natural hazards, and environmental quality, to improve Arizonans lives, safety, and economic well-being. Dr. Michael Conway is newly hired as Chief of the GES. Mike joins us after 9 years as a professor of geology at Arizona Western College in Yuma, and extensive experience in K-12 education, geologic hazards, and science outreach. Mike is putting together an aggressive agenda to better bring AZGS’s technical capabilities to bear on challenging problems facing society. On March 26, the Museum of Northern Arizona in Flagstaff received “Interim Accreditation” from the American Association of Museums. An on-site visit to MNA is expected in late 2007 which is the next step in restoring full accreditation to the Museum. The membership revolt was almost unheard of in museum circles. The new director, Dr. Robert Breunig took over fulltime in January, 2004 and re-opened the geology department as well as moving quickly to regain accreditation and rebuild the museums quality and reputation. MNA is preparing a major new dinosaur exhibit for Fall 2007. AZGS will be working with world-renowned Museum paleontologist Dr. David Gillette to showcase the event. Congressman Raul Grijalva organized a Climate Change Roundtable in Tucson last Friday, the same day the latest IPCC report on climate change was released. A couple dozen of us were invited to briefly talk about the impacts of climate change or options to counter them. I was asked to cover geothermal energy. greenhouse gas. When geothermal energy is used for direct space heating or in geothermal heat pumps, the production of carbon dioxide is even less. Geothermal is also “24/7” – it can be part of a utility’s base load, which is a critical factor in utility’s being able to meet state and federal requirements for delivering power. 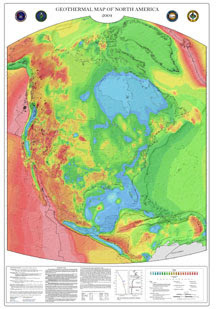 Arizona has little high-temperature geothermal potential but large untapped low to moderate temperature resources, particularly with Enhanced (or Engineered) Geothermal Systems (EGS) and Geothermal Heat Pumps. But research is needed to develop EGS technology to make it cost effective and practical. watertable is deep, requiring more coils to be buried in the ground or deeper holes drilled to reach the water. Therefore, tax incentives to homeowners and businesses could be critical to widespread installation in areas like Arizona. Federal funding for DOE's Geothermal Technologies Program was zeroed out in the President’s FY08 budget for the second consecutive year. Federal programs are spending their remaining funds closing down, archiving files, rather than working on their core functions. Staff researchers are finding other jobs before the federal programs close their doors. Will we be able to lure them back if funding is restored by Congress, or will they stay in more secure jobs elsewhere? 1. Geothermal research by the Federal government should be stabilized and increased into technologies that can reduce risk, reduce costs, or expand the accessible resource base. 2. Better resource information is needed in an easily accessible, integrated, interoperable online data network. 3. The Department of Energy’s GeoPowering the West initiative should continue to support efforts for utilization of the West’s untapped geothermal resources. 4. Federal tax credits and incentives and timely permitting and environmental reviews are critical to expanded marketplace development.